Dave is out there right now on the Grand Loop race. It started at 6pm Friday in Grand Junction. I happened to be at Dewey Bridge on a raft trip the night the race rolled over the bridge. I didn't plan it - serendiptiy at work. Dave rolled over in first place at 3:15am. He was 45 minutes ahead of schedule. I was just getting up to make coffee when we heard a whooping coming from the direction of the bridge. We were camped about 200 yards from the bridge. Next I hear wheels on dirt and dashed up to the road with one shoe on and caught him. It was an amazing moment. The moon was huge and bright - almost full. Moonlight was making the white stanchions on Dewey bridge glow, throwing moon rays and shadows higgldy piggdly down on the river. The air was still and warm. The type of moment cameras can't catch. The light was low but vivid. Colorful but subtle. Dave was in the zone feeling no pain. Steve described him as giddy and jubilant. He only stopped for about 5 minutes and spent most of it stuffing his face. Looks like all systems were working... He was giving off incredible energy! ..and then he was gone. As we watched him ride off into the moonlight goose bumps stood up on my arms and I was flooded with a mix of awe and envy. I told Steve I had goose bumps and he said he did too. He said we just witnessed something special. It was like he was riding in a cocoon of magic that moved on up the road with him. After he left the moon dropped behind the mesa and things turned flat and dark again. Now I am in Colorado for a family reunion/vacation. My brand new GPS tells me my ride maximum elevation was 10,052 and minimum 8,235 feet - dizzy desert bunny! We pack light for vacations. Second chances are a wonderful thing since I rarely get anything right the first go-round. Usually though, I have to wait awhile for round two. Not this time. 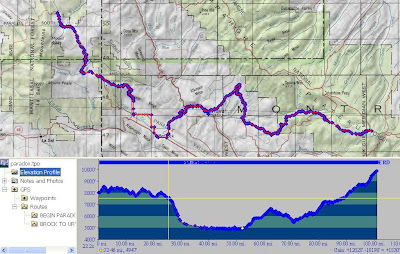 Just 2 weeks after the solo Grand Loop attempt (where I got stuffed by too much snow), I'll be lining up at the start of the official event in Grand Junction Friday 6pm. Two weeks after a big effort seems to be just about perfect timing for me...I didn't plan it this way but hey, I'll take it! I also have the benefit of learning a lot of stuff in the first try and as a result will be 11-12 lbs lighter overall. This only equates to a 5% increase in w/kg for total weight at typical enduro climbing power, but I'll take it. Every bit helps on a route with 340 miles of difficult terrain and 40,000'+ of climbing. It is different this time - I'm a bit more nervous, anticipation is thicker. Maybe cause I have expecations for myself this time. One thing that hasn't changed is how much I look forward to uninterupted riding and time under the big blue sky. Is GDR in my future? Then what? Well for now GLR is aplenty. It's been relatively cool and it even snowed above 8k since my solo ride...so that snowy section will still be a challenge. Should be interesting. The new camera is making the journey with me, look for a colorful update early next week. There could have been no better way to begin a Grand Loop solo TT than to stage from Mike Curiaks home. He's a machine both on and off the bike - the way he was putting wheels together as we talked exuded the sort of expertise you want from the person building the most important part of your bike. I haven't spent a lot of time talking to him and have usually had the impression his hard earned lessons in endurance racing were closely guarded from a competitive stantpoint. Such is not the case - he understands that the most valued lessons learned are those learned through trial, error, and pain. Those are things you won't forget, and things you will cherish. To freely hand those out is to cheat the new ultra rider out of a good part of the experience. As we roll out to Loma on pavement, we chatted about a lot of things and at times I was in stitches. Mike is a cunning rider; you don't set long distance records by luck or chance and some of his strategies had me getting an early ab workout. Rolling into the Kokopelli TH at Loma we met Pete Basinger who I had not met before. The more multi day ultra riders I meet, the more I'm convinced it's a big boy's game - literally. Pete, Mike, Scott M., Stephan - all are considerably bigger than my 140ish lbs. The reason is simple - there's a fixed amount of gear required to get these done, and the larger the rider the less the percentage of body weight of the gear. No matter what my w/kg is, it changes drastically when considering my beginning gear weight was ~ 1/2 of my bodyweight. Rather significant when a route entails some 40k+ feet of climbing, eh? Just before sunset I head off down the Kokopelli trail, alone in my thoughts for the next 3 days. This was a great feeling. I was on the Yeti, recently tuned to perfection by Andy at Desert Cyclery in StG. In addition, I'd asked him to get as many water bottle mounts on it as possible and it came back with 6!!! This is 5 more than the bike has mounts for. Impressive work my man. This was great. It meant I didn't need to use my pack bladder at all, and therefore didn't need the rear OMM rack to haul extra food/gear. Before I knew it, I was at the top of the hike out from Salt Creek. MP3 on, I was ripping along in a moonless night under the power of 500 lumens of my custom lights. Rabbits and mice were everywhere. Now there are a few less. As many times as I'd ridden this trail in the past year you'd think I could follow it blindfolded - but I was in such a great groove with the tunes and vibes of riding through the night that just past Rabbit Valley I made a left down to the river instead of heading upwards towards Westwater. I almost made it to the river before I figured it out. DUH. An hour later I was back at the missed turn, slightly aggravated with my error - and hugely aware that this wasn't a "paint by numbers" endeavor and I better wake up and start paying attention. Working my way up N. Beaver Mesa I was astounded by the flowers. The building billowy cumulus clouds, blue sky, greeness spring was really accentuating the bloom. I really enjoyed this new region and I'll be back in a non-race setting sometime...sadly, this is the last picture my camera took the whole time. The next time I went to snap a shot it was dead as a dodo. 160 miles done, I made a little nest in the sand and slept like a baby. A few hours later I awoke to sky sparkling with stars and the rare sound of a live, running Dolores river. Suddenly I was ALIVE. Oh man that was a fine time. I slammed some breakfast, packed up, and started off in the dark. The river canyons were lively as both the Dolores and San Miguel were running high. Lots of class II stuff to listen to as I rode by. Next up was the Spring creek mesa climb which was relatively uneventful. Cows early on made for some poop dodging as I had a water bottle in the crud catcher position. Arriving at Tab creek it was time for some calories to go down the hatch while filtering enough water for the most challenging section of the Paradox, Tab Creek to Hauser road. Having pre-ridden it with CP and DN, I knew what was coming, at least to Pinto Mesa. It got fairly hot here and I did stop under a tree once or twice, but still made good time. Arriving at the top of Pinto Mesa a very light shower blew over to provide my own personal misty cooling system - manna from heaven. Actually, it was from the Uncompahgre plateau, that great weather cooker. Each day I'd see clouds form over the top of this beast of a landform. Hauser road. Upward and onward. Soon I reached to Divide road at nearly 10,000' and was somwhat alarmed by the quantity of snow still remaining. It was a dry, warm March that had snowpack much reduced from normal levels and I had guessed it would be OK by now, but now I wasn't certain. A few miles later, heading up the powerlines everything was dry and snow free. Where the tab singletrack heads into the woods, it was not so dry and I was dodging snowbanks and fallen trees, but the going wasn't too bad. I was hoping to make some good progress on the Rubidau section before a short bivvy, but man this was looking grim. Then it got worse. postholing through crotch deep drifts, dragging a loaded rig, is just a lot harder than riding a bike. And I was moving inches per hour, not miles...after a few hours of this it was clear I wasn't going to get through this section before sunset. There was no way I'd make it through here in the dark, if at all. Decision time: should I bail down transfer road and call it quits, and if so, then what? Should I skirt the singletrack section via Divide road? Should I cry for mamma? Truth be told, I was damn tired and didn't trust my decision making ability in this situation. So, I backtracked out of the snowy area to find dry ground, built a white man's fire and made dinner. Slept like a baby again, and since there was no need to start before daylight had lots of time to sleep too. I'd hit the snow puzzle in the am with a fresh pair of eyes. It froze up there overnight, so the snow was crusted. I could make easier progress without postholing. But eventually the trail sidehills on a steeply sidehill slope in deep, dark timber. This was my undoing - there was not a patch of ground to be seen, it was all 5-10 feet of snow and trees. Trail? What trail? It was winter. I tried to guess where the trail would go and followed that route for a few hours, but realized I had gone about 1/2 mile in 3 hours - doing the math, it was going to take another week to finish this 7 mile section. Stick a fork in this GL attempt. Game over, film at 11. Getting out of there proved no easy task. The sun was up, the air warming, the snow's crust softening. Where I was able to walk on the crust earlier, I was now postholing again, but I was much farther in than yesterday. To complicate things, coming in I didn't make lasting tracks and navigation in those dark woods is rather disorienting to say the least. The GPS saved my bacon in this area as I was able to follow my track out of there. 6 hard hours later, I was back to the Divide road. I started pedalling...soon thereafter I came to the road that shoots down to the Roubideau trail - and it looked rideable. Soupy, but totally doable. Yet another decision to be made. Do I head down this road, pick up the tab and do the remainder of the route? I had been salivating over the idea of doing this trail for a long time. It started last summer, and really heightened when laid up this winter. Mapping it out intensified it further. Yet, I was now a DNF for the GL, which could mean only one thing: I would be back. To ride the tab would be in essence to pre-ride the tab, and I would cheat myself out of the intense experience back on Glencoe. I held a straight line, sticking to the Divide road, and never looked back. 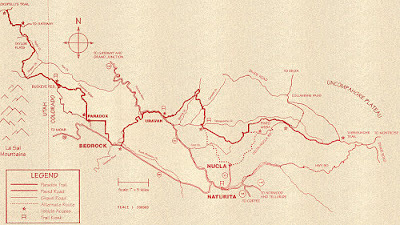 The Divide road did not dissapoint and affording sweeping views of at least half the planet. At one overlook, you could look down on Glencoe bench and the route up to Pinto Mesa. That in itself was a real sense of accomplishment. Funny, I felt probably better this day than all the previous two, and tapped out the ~100 miles back to GJ in no time. I got to see the Uncompahgre plateau from the top; it's deep dark timber in the south, giving way to aspen and open meadows in the north, and eye popping canyons descending to the Gunnison river drainage. Deer, elk, bear, porcupines, a blind rodent crawling in my bag, wild turkeys are just a few of the wildlife encounters. After it's all said and done, I covered 345 miles in under 3 days time and was flooded by many emotions, thoughts, experiences. Of the entire experience, my favorite part? By far, that left undone. It's game time. All the planning, training, anticipation have culminated in this moment. Today I begin a solo time trial of the Grand Loop. As you can tell lately, this isn't something I'm taking lightly. This route has nearly destroyed tougher men than I. Some comforting words came my way yesterday. - Mike Curiak (who established this race) upon learning of my plan: "sheeeeit, glad it's you and not me..."
- Sager: "it's an interesting place you guys go." He ain't talking geography either. But I can take comfort in knowing it has been done before. Mostly I'm just thrilled to have the health and fitness to contemplate such a ride. It will be a great learning experience. New limits will surely be found, and with luck, extended. To all those doing KTR, good luck, play fair, and I'll (eventually) miss y'all, but I'll be deep in my own cocoon during your race. If the plan pans out I'll be at the Virginian hotel in Moab Sun am, prolly dead as a dodo but willing go out for b-fast and swap stories. Hope to see some of y'all there. There is this event that has been looming large for me for quite some time. My training, equipment & nutrition so far this year has been focused on this single goal. The event is the Grand Loop. The scheduled race date is June 1, but since it is technically a time trial event can be done at any time. I have chosen to do it ahead of the official race date. Snowpack is low this year and that's the main reason the race is scheduled as late as it is. I'll be posting a few bits and pieces about the event prior to my departure. The whats, the whys, the hows, the wheres. The intent is not so much to inform those interested in the event, but rather to shed some light on this obscure event and genre of racing for those not familiar with it. Yeah it haunts me, I can flash back with ease. Suddenly i feel that deperate panic pounding with adrenaline, that cooked beyond recogintion totally used up feeling. Oh my, i was about 24 hours in when Scott and I hit Fischer creek in the La Sals, and i swear at the time i was never going to do this again, never, my mind and body was in revolt, " you foolish dupe!" And to be honest the first 24 were the easiest part. Not to discourage anyone from an attempt, but imagine this, a 24 hour race, a 100 mile race and then another 24 hour race, back to back, little sleep, horrible trail conditions, and carrying everything on your back and bike. No one to clap and encourage you on, keep you company, make you food, fill your camelback. It was one of those experiences that i will never be able to forget, trully life changing, yet it still hurts a bit deep down. The pink can't even soften those words...yet the anticipation, the draw, is huge. All the goods are in: racks, waterproof panniers, packs, hydration systems, lightweight bivy gear, GPS, maps. Now, how does all this stuff a) fit on a bike, and b) work? 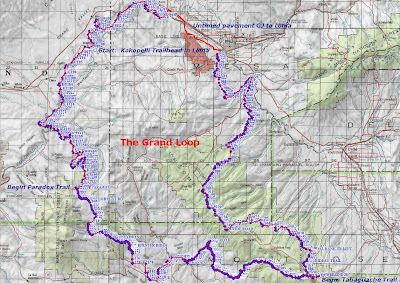 The middle section of the Grand Loop Race is the Paradox trail. Getting maps for this has been more than challenging. An email request to COPMOBA was returned 3 weeks later with a suggestion of joining the organization and requesting the map pack - with another 2-3 week turnaround time. I don't mind supporting MTB trail advocacy groups (and joined up), but the delays...are like getting a passport. Fortunately, I'm resourceful and google ferrets out the goods. Using this map as a guide and the BLM section descriptions, I've mapped out a GPS route in NG Topo! This weekend is Paradox recon weekend. Hard to tell where the mudline will be...if I'm lucky and can get to the 8000' mark I'll be able to check out the Glencoe bench area - one of the routefinding toughies of the Paradox. The Paradox goes through some awesome river canyons at the lower elevations, should be the perfect time of the season for those. It'll be much nicer now than in June! Oh, and an added bonus: the camera lives. Pics to follow. Anyone wanna join in the fun? The past week I've been in Backcountry Experience no less than 4 times. The 3rd time one of the guys that work there saw me walk in the door and exclaimed "Buy me backpacking now!" OK, so he didn't get the specifics right. Bikepacking would have been a better term. But I did buy it last week, LOL. As it turns out, the Grand Loop Race is going to be more expensive than doing the BC Bike race this year. Nothing left to do but give it a test run, so instead of doing the big group rimride pre-ride, I opted for a solo overnight of the Kokopelli Trail. That route is just nothing but good vibes. School was in session. Packing for a self-supported overnight by bike took as much time as getting ready for a 24 hour. Ugh. That put me at the Fruita side of the KT at 5pm on Saturday. I've got good lights and was looking forward to some time in the dark. The sunset was a beauty on the Troy Built trail. It's getting green out there already. Springtime is making an early showing. So the big question for this type of effort is how much you can do without. This I learned in retrospect ;) Hiking up from Salt Creek with a 45 lb rig and wearing a 20 lb backpack felt a lot like work. Reading various GLR reports I was wondering why nobody hit the Bedrock store before it closed. Well duh. Aside from the heat riders faced last year, it's a whole nuther ballgame with a loaded bike and backpack - everything you need for 3-4 days. Yep, that's the Dos Niner all loaded up there. Big, big revelations with this rig. First of all, I've never got much suspension travel out of the softail design. I'm too light to get it to move. But - put a trunk on the back with my grub, and a heavy pack - suddenly the bike felt as smooth (or better) than the Fuel. I was getting full travel out of it and it felt great! Much to my surprise, the 29" wheels felt great with a loaded rig. With this much weight it just feels like it holds momentum so well. This bike was just about to get dissassembled and sold...but maybe not. So...everything gets redistributed between my pack and the front. No biggie. And the riding? What a hoot. Cruising through the Rabbit Valley area in the dark, I come around a corner to hear ~ 20 generators. RVs on the KT? And then the real treat, getting chased by dogs in the dark. Sweet. As the high points of the KT near Moab are still under snow, I opted to finish the ride with an out and back from Dewey bridge to Top of the World. It was a good litmus test to see what a 3000 foot steep techy climb will feel like loaded after 5 hours of riding. At the top of the climb, suddenly the trail ends and you ARE at the top of the world. Breathless, literally. There are some incredible stories coming out of Alaska right now. The Iditarod trail race is a 350 or 1100 mile winter race through the heart of Alaska - in winter! Mode of travel is optional. Some bike, some run, some ski. Read this thread over on MTBR and if you don't get all jacked up you best get your pulse checked. 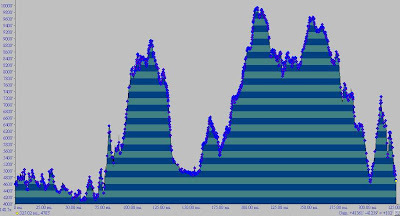 Lots of illuminating commentary by the previous course record holder Mike Curiak on what the leaders are likely experiencing, thinking, feeling, and what tactics they are opting to use. Prolly the most engrossing MTBR thread I've come across. Congrats to anyone that started this event, special congrats to anyone that finished, and super special congrats to Jay P for busting out such an amazing ride as a rookie. Clearly in a 3+ day period ya gotta get some shuteye. How much grub do you have to carry? Water filter or tablets? Cooking gear or go with all cold stuff? I've never even done an overnight by bike so school is in session. The attraction of this event is tugging at me with the power of a black hole - and it is a bit of a black hole as well. It'd be cocky to do it with any sort of plan to "race" it the first time around - if I do it the goal will be to finish. Besides, with events like the BC Bike Race, 24 hour worlds, and the 24 hours of Moab in the season plan, it'd be darn risky to burn the candle at both ends for 3 days in the heat of June. Physically, I am ready for this race. Not so long ago I had the impression than when the bonk came that was the end. But in the past 2 years there have been many times when I thought I was done, only to experience a quick rebound. All it takes is a bit of fuel, water, maybe a nap, and I'm good to go again....mentally, I need a new challenge. Cycling has always had a way of providing new challenges. I feel a good obsession building.